The U.S. state of Alaska is divided into 19 organized boroughs and one "Unorganized Borough." Alaska and Louisiana are the only states that do not call their first-order administrative subdivisions counties (Louisiana uses parishes instead). 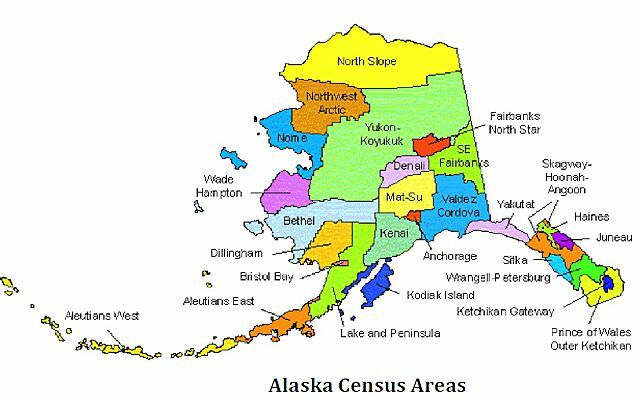 Many of the most densely populated regions of the state are part of Alaska's boroughs, which function similarly to counties in other states. Unlike county equivalents in the other 49 states, the organized boroughs do not cover the entire land area of the state. The area not part of any organized borough is referred to as the unorganized borough. The U.S. Census Bureau, in cooperation with the state, divides the Unorganized Borough into 10 census areas, each roughly corresponding to an election district, thus totaling 29 county equivalents. However, these areas exist solely for the purposes of statistical analysis and presentation. They have no government of their own. Boroughs and census areas are both treated as county-level equivalents by the Census Bureau. Based in Sand Point, the Aleutians East Borough comprises the westernmost portion of the Alaska Peninsula, and a number of Aleutian islands. The Aleutian Islands (possibly from Chukchi aliat, meaning “island”) are a chain of small islands situated in the Northern Pacific Ocean, and extending about 1,200 miles westward from the extremity of the Alaskan peninsula toward the peninsula of Kamchatka. The Aleutians West Census Area has no borough seat. The census area has a total area of 36,562 km² (14,117 mi²). 11,388 km² (4,397 mi²) of it is land and 25,174 km² (9,720 mi²) of it is water. The total area is 68.85% water. The people refer to themselves as Ungangan, and have been called “Aleut.” The Aleut language is related most closely to Eskimo languages. Bristol Bay Borough is located in Southwest Alaska, at the upper eastern end of Bristol Bay, also known as Iilgayaq Bay. The Katmai National Park is adjacent to the Borough. The community is located in the Kvichak Recording District.The region was first settled by Athabascan Indians, Central Yup’ik Eskimos and Sugpiaq (Aleut-Russian) Eskimos.